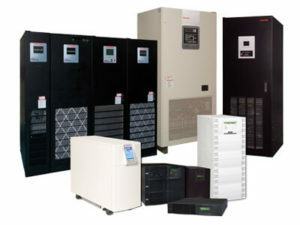 Single-phase UPS models range from 1 to 22 kVA. Three-phase single module systems range from 13.5 to 2,000 kW. Three-phase parallel module systems are available in 90 to 16,000 kW. These systems are suitable for a wide range of applications including data centers, telecommunication, retail, healthcare, broadcasting, and industrial. Reliable and efficient, the Toshiba T1000 Series is a single-phase double conversion UPS that is designed for IT and retail installations. Features a 0.9 output power factor and is available in a range of sizes from 1 to 6kVA. As a double-conversion online UPS, supplies uninterrupted, clean single-phase power to critical systems over large input voltage deviations without resorting to battery backup. And when paired with Toshiba’s RemotEye™ 4, you can monitor and manage your UPS remotely with features such as email alerts, history/event logs, and remote client shutdown. The 1600XP/XPi Series is single-phase double-conversion UPS, available in a range of sizes: 3.6 kVA, 6.0 kVA, 8.0 kVA, 10.0 kVA, 14 kVA, 18 kVA, and 22 kVA. 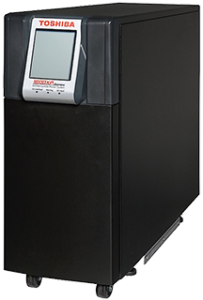 Available in a tower design solution with a LCD touch-screen display that provides unmatched access for UPS monitoring and control. As a double-conversion online UPS, supplies uninterrupted, clean single-phase power to critical systems over large input voltage deviations without resorting to battery backup. 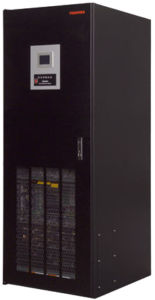 The Toshiba 4400 Series uninterruptible power system (UPS) is the next-generation three-phase UPS. The double-conversion, all insulated-gate bipolar transistor (IGBT) 4400 Series UPS features a digitally controlled IGBT input rectifier, an intelligent low harmonic pulse-width modulation (PWM) output, state-of-the-art electronic battery isolation circuitry, and an easy to navigate local touchscreen interface. The small footprint and total front access mechanical design requires zero rear clearance and includes features such as top, bottom, and/or side cable entry, standard sized air filter provisions, and lockable keyed doors. Customization is available through a number of options, such as internal battery backup, internal transformers for specific voltage applications, and remote monitoring with the Toshiba RemotEye® 4 multi-protocol UPS monitoring solution. The G9000 Series UPS is available in capacities of 100, 160, 225, 300, 500, 750, and 1000kVA and comes with an industry-leading three-year onsite warranty. It is designed for stand-alone or parallel use in up to eight-unit configurations without requiring the use of a special switchgear cabinet. Using the new Toshiba IGBT technology in the rectifier/converter, DC/DC chopper, and the inverter sections of the UPS, the G9000’s double-conversion topology provides an AC/DC/AC efficiencies of up to 97% at loads from 50% to 100%. Even at 20% loading, the efficiency remains greater than 94%. This is 10% to 20% better than current industry systems, making the G9000 excellent for N+1 parallel systems where loads are typically 30-40%. Contact us to request a quote or for more information.